With over 77 years of extensive experience in manufacturing electrical enclosures for the OEM, Commercial Construction, and MRO markets, the Hubbell Wiegmann name has become synonymous with traditional NEMA enclosures, JIC enclosures, non-metallic enclosures, aluminum enclosures, and wireway systems. Spec Tech carries Wiegmann Enclosure and Hubbell Wiegmann Industrial Enclosures. Spec-Tech Industrial Electric is a stocking distributor of automation products and parts. 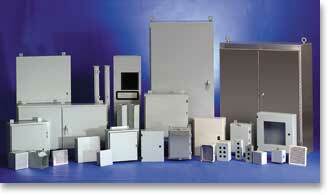 We carry Hubbell Wiegmann enclosures for industrial factory and process applications.